We all can appreciate the value of a good education, however, many teachers struggle to provide the needed tools for their classrooms to accomplish this goal. 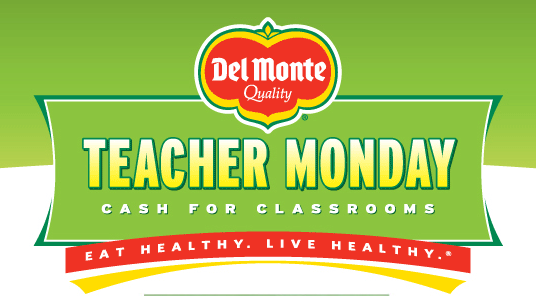 Del Monte is giving teachers throughout the U.S., Canada and Central America the opportunity to win cash for their classrooms. Del Monte is also providing their delicious wholesome snacks to encourage healthy eating in kids. But wait there is more: Schools located in Del Monte Fresh Produce’s tropical growing regions; Costa Rica and Guatemala, will also receive grants for school supplies. 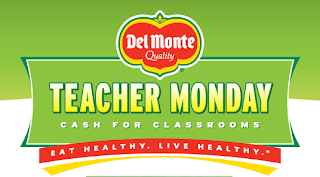 If you would like to learn more or if you are a teacher in need of school supplies visit Del Monte Teacher Monday. You can also visit Del Monte on Facebook. Banana nut smoothie sounds like a good idea for my Blendtec! It would give protein and potassium and be filling at once! The fresh cut papayas caught my eye! I like Halftime Hamburger Recipe. 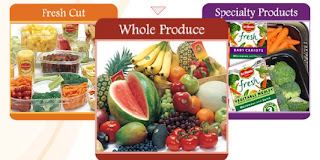 Hi, I follow your blog on Google Friend Connect and follow Del Monte Fresh on twitter (@shala_darkstone). Thanks for the great giveaway! I like their ambrosia recipe. The Cinnamony Smoothie on Dole's website looks yummy! I liked the specialty product and they would make great lunch snack for lunches. The Corn Guacamole Recipe sounds sooo good! The kid-friendly recipe section is filled with tons of great ideas for getting kids to eat healthy! I follow FPR on GFC and Del Monte Fresh on twitter. I love how Del Monte has there recipes broken down by categories like breakfast, shakes, etc. 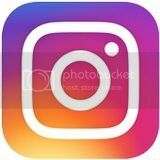 I follow FPR on twitter as tracysuz. I subscribe to you via google as tonasun. I already follow on Networked Blogs as Tracy Suzanne. The apple salad sounds really good. Something that caught my eyes are the mandarin oranges b/c the kids love them. What caught my eye on their site is the recipe for Avocado Tostada. Oh yum!! There was an awesome Green Salsa Recipe at the Del Monte site. :) I am definitely going to make this. I like the recipe for the Costa Rica smoothie. I think the blackened shrimp pineapple salad is def. something that will go in my recipe box! I am following you on Google Friends Connect and I am following Del Monte on Twitter, ILoveEgypt. I like that Del Monte has Smoothe recipes on their web site. I am following you on the Reader, but under a different email,if I win please ask me and I will give you the other email, thank you. I didn't know they had so many delicious recipes on their website. Oh the Caldo Tlalpeño Recipe sounds fantastic! i love Avacados! The Cantaloupe Chicken Salad recipe sounds really good! I follow with GFC (mail4rosey) and I follow Del Monte on Twitter (mail4rosey). Following you with goodle friend and delmonte on twitter! i follow Del Monte Fresh on twitter - js22222222 . Their recipe for Apple Ice Cream Pie sounds great! 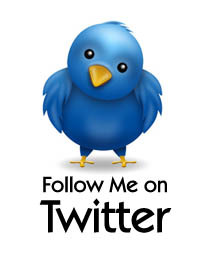 We follow you on Google Friend and follow Del Monte Fresh on twitter. Their new fruit crisps look good! Del Monte's recipe for fruit kebobs looks good to me. GFC follower (please follow my blog) and follow of Del Monte on Twitter. Banana Oatmeal Cookies recipe caught my eye. Follow via GFC and follow delmonte on twitter. I like their smoothie recipes! Thanks! I subscribe to your RSS via Google Reader! The Frozen Tropical Delight Recipe looks pretty good. I'm following Del Monte Fresh on Twitter (I'm @LuckyJinxy). I follow this blog on Google Friend Connect and I follow Del Monte Fresh on twitter as willitara. vending services isn't something you've got to tackle all on your own either. American healthcare is at the forefront of international news ,Fresh Healthy Vending has to offer and do your part in making America feel better about itself committed to assisting locations across the US provide healthy snacks conveniently.